Mumbai: The Kokilaben Dhirubhai Ambani Hospital here has secured The Joint Commission International’s USA Gold Seal of Approval accreditation as a symbol of quality and commitment to very high standards and safety of the patients, it was announced. With this, the seven-year-old KDAH becomes the only hospital in Mumbai and the only other in the country to have all the four major accreditations – NABH, NABL, CAP and now the JCI. “Kokilaben Ambani Hospital is delighted to receive the JCI certification from the premier healthcare quality improvement and accreditation body in the US. 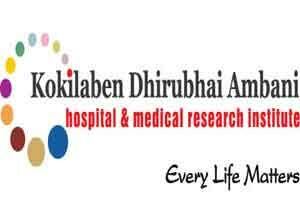 It has further enthused the entire team to provide an all-round comprehensive and well-coordinated treatment regime to all care receivers,” said KDAH chairperson Tina Ambani, whose attention to detail and unwavering faith in the credo “Every life matters” are visible across all facets and operations of the hospital. JCI’s Accreditation and Certification Operations division COO Mark G. Pelletier commended the KDAH for “successfully achieving this certification and for its dedicated to become a quality improvement organisation”.